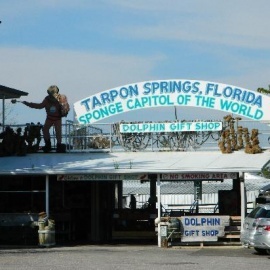 Tarpon Springs, Florida is a small town with a large history located on Florida's west coast. Tarpon Springs is located at the mouth of the Anclote River which pours into the Gulf of Mexico. It is here that the settlers discovered they could make a living sponge diving. These natural sponges have been used for centuries by people allover the world. Till this day, sponging is an active form of employment in this area. While you are in Tarpon Springs you must visit one of the fabulous Greek restaurants in the area. Along with this fabulous food you will find many antique stores and specialty shops located along their main highway. Stop and visit the Heritage Museum or sign up for an echo-tour. Whatever you do while you are in Tarpon Springs, don't forget to enjoy the beach. The beautiful sugar white sands of the Gulf of Mexico are breath taking and the warm water is always great to swim in. This charming historical town will soon become a favorite place to visit. Each time you return you will discover something you had not noticed before. The wonderful weather and access to a great beach makes it the place to visit for those quick weekend get aways. The arts scene in the 727area this week features two critically-acclaimed performances from two of the best theatre companies in the Bay Area. 21AprCelebrate Easter: Easter Egg Hunt!